Every day, learners use and reuse open, digital resources for learning. 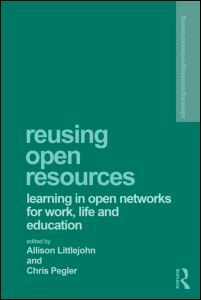 Reusing Open Resources offers a vision of the potential of these open, online resources to support learning. The book follows on from Reusing Online Resources: A Sustainable Approach to E-learning. At that time focus was on the creation, release and reuse of digital learning resources modeled on educational materials. Since then the open release of resources and data has become mainstream, rather than specialist, changing societal expectations around resource reuse. Social and professional learning networks are now routine places for the exchange of online knowledge resources that are shared, manipulated and reused in new ways, opening opportunities for new models of business, research and learning. The goal of this book is to extend the debate of how open, online resources might support learning across diverse contexts. Twenty-four distinguished experts from nine countries distributed across Europe and North America contribute empirical evidence and ideas. Collectively they provide a vision of the potential of open, online resources to support learning across everyday contexts of education, work and life. My own contribution titled “Open-sourcing personal learning” (pp. 43-56) became chapter 3 of this newly released addition to the “Advancing technology-enhanced learning” series at Routledge. Many thanks to Allison and Chris for an outstanding managing and editing job!